Hot Fractured Rock Geothermal Energy - the Answer to Global Warming? Energy is, and will remain, the largest business on Earth. This industry is undergoing major changes as the world grapples with climate change, pollution and the need for renewable energy. One source of renewable energy is hot fractured rock (HFR) geothermal energy. HFR geothermal energy is produced using heat extracted from buried hot granites by circulating water through an engineered, artificial reservoir or underground heat exchanger. These hot granites represent a massive source of renewable energy, free from CO2 emissions. The development of HFR geothermal energy relies on existing technologies. HFR geothermal projects are currently underway in France, Switzerland, Germany, California, and Japan. Australia has a recognised potential for the development of HFR geothermal energy. Perhaps HFR is the answer to the world's future energy needs - a source that does not exacerbate the problem of global warming, is safe and seemingly available in infinite supply. This report entitled, "The Future of Geothermal Energy" suggests that the amount of extractable HFR energy exceeds the world's current consumption by a factor of several thousand! To quote Sheikh Yamani: "The Stone Age did not end because people ran out of stones - it ended because they found something better." What is Hot Fractured Rock Energy? Click here and here to find out. With thanks to Geodynamics, the Australian geothermal power company for the images and text. OXFORD: The waterless carwash product, Miracle Drywash, was honoured in March 2007, on United Nations World Water Day, by Waterwise, the UK’s leading authority on water efficiency. The product was awarded the prestigious Waterwise Marque at the annual Waterwise Water Efficiency Conference, held at Oxford University. 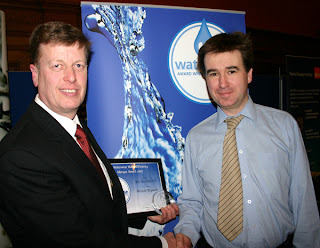 Tim Jones of SJK Products, manufacturers of Miracle Drywash, receiving the Waterwise award from Waterwise Director, Jacob Tompkins. The Marque is awarded annually to products which reduce water wastage or raise the awareness of water efficiency. Judged by a panel of water efficiency experts, Miracle Drywash was awarded the Marque because it offers a major contribution to water efficiency and it was also considered to give out a good message in terms of saving both water and time. 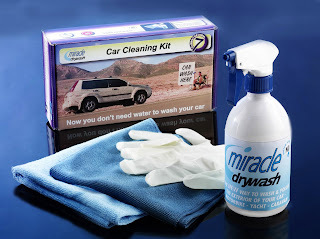 Miracle Drywash, the totally waterless car washing and polishing system. The Waterwise Marque – the first scheme in the UK to highlight water-efficient products, founded in 2006 – was also awarded this year to a dishwasher, an aerated showerhead, water storing gels for the garden, a waterless urinal, a new dual flush toilet, drought resistant turf, a device to recycle your bathwater, a garden drip irrigation system, tap flow restrictors and devices to reduce the amount of water used when flushing the toilet. Waterwise (www.waterwise.org.uk) is an independent, not for profit, non-governmental organisation and is the leading authority on water efficiency in the UK. It sits on the UK Environment Minister’s Water Saving Group alongside the water industry and regulators and it works together with water companies, manufacturers, retailers, NGOs, environmentalists, regulators, domestic consumers and the media.